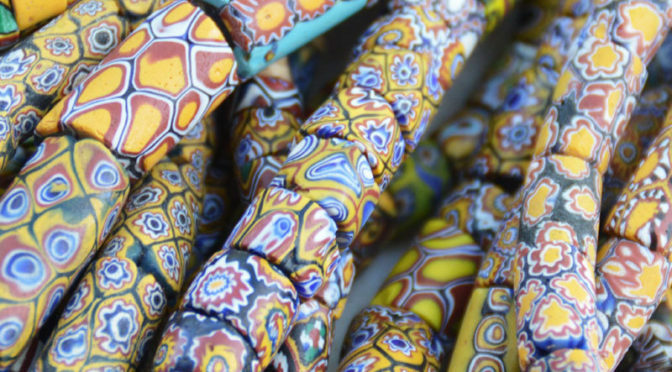 This blog is dedicated to African Beads – about them, where they come from, how they are made, and the regions they come from. 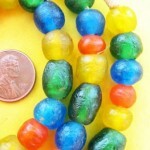 This blog is an expansion of our web-store, Rex’s African Bead Shop (rexbeads.com). If you are interested in purchasing any of the products mentioned here, please visit our store. Thank You, and enjoy your stay. 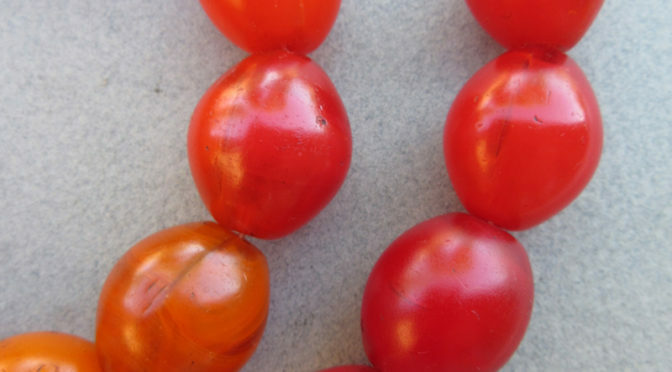 Tomato beads are a type of seed bead that was commonly used during the African slave trade in past centuries. 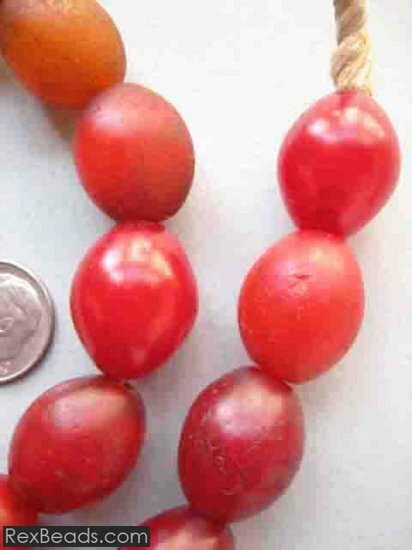 Originating from Venice where they were manufactured, tomato beads are large and slightly translucent. 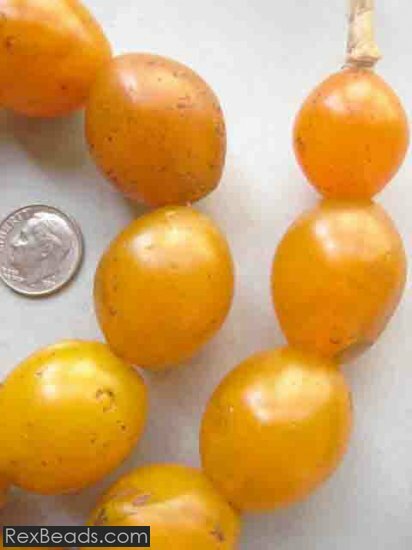 They have an irregular rounded shape and may appear in brilliant shades of red and yellow. 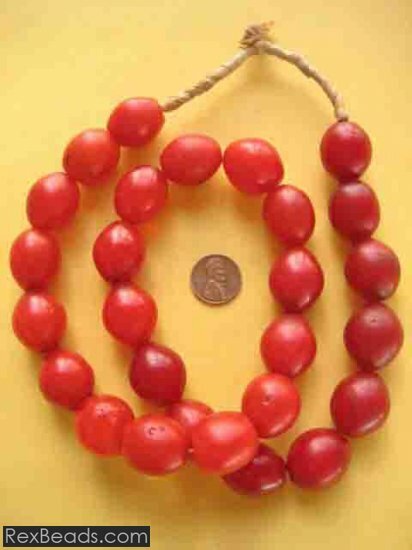 Largely traded in Ethiopia, tomato beads get their name from their tomato-like shape and served as one of the earliest forms of trade currency in this region. 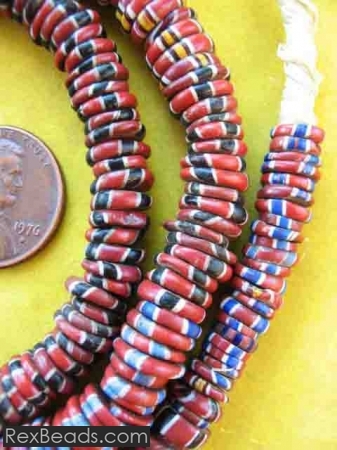 A high intrinsic value was placed on tomato beads as the people of this region, just as everywhere else in Africa, truly valued decorative items such as beads. 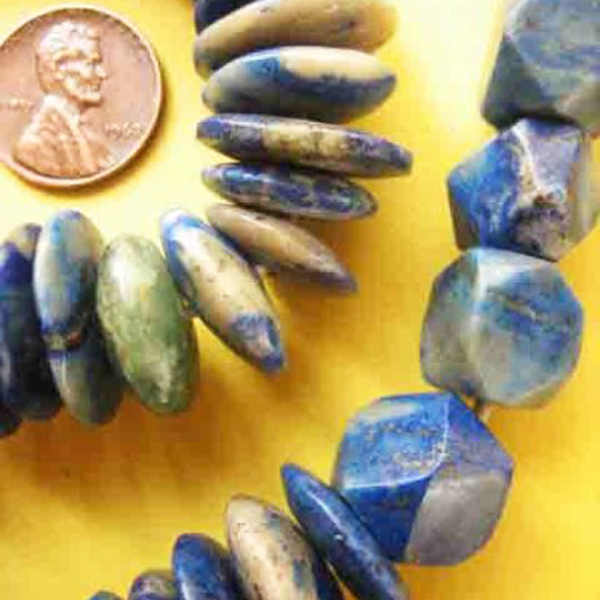 Some wearers of lapis lazuli beads wear them in the belief that the beads will protect them from evil, keep the father in the household safe, as well as attract good fortune. 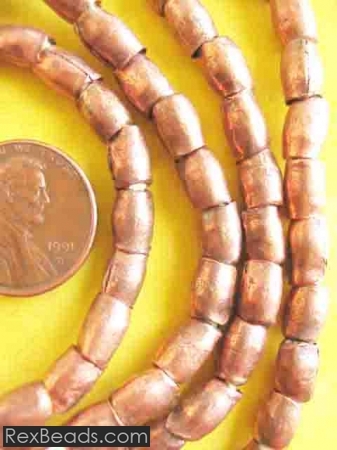 These beads are also believed to bring inner piece, tranquility and happiness, while heightening clarity, concentration and instincts of the wearer. 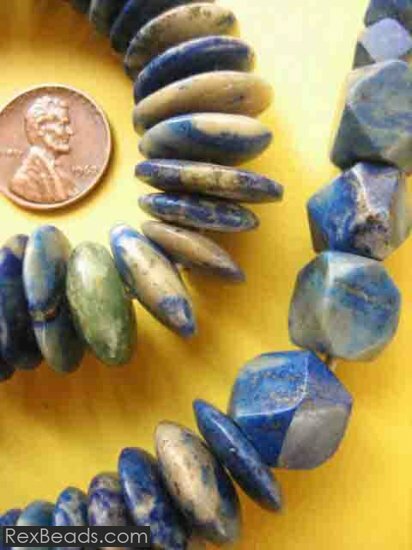 Even if you are not a believer yourself, you may nevertheless enjoy the beauty of lapis lazuli beads which make great looking jewelry items. 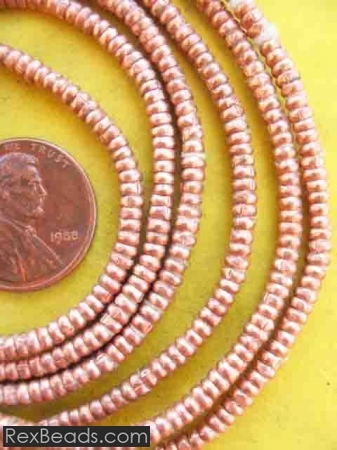 The beads are available in various attractive sizes and shapes including the top drilled skinny beads, round beads, small chip beads and tear drops which are great for making earrings. Experts speculate that the process of slumping was in actual fact carried out in Africa as there is no evidence of the slumped slices ever being sold in Venice. 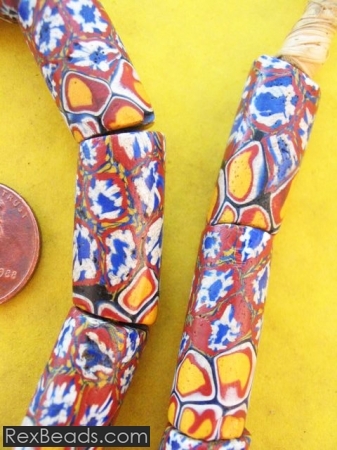 Aja beads range in size, color and canes with the most spectacular being crafted from Rosetta or chevron cane. 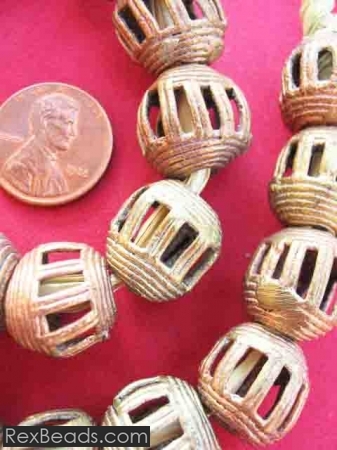 These beautiful and somewhat unusual beads are today used to craft exquisite jewelry pieces such as those featuring 4-layer “yellow jacket” slices. 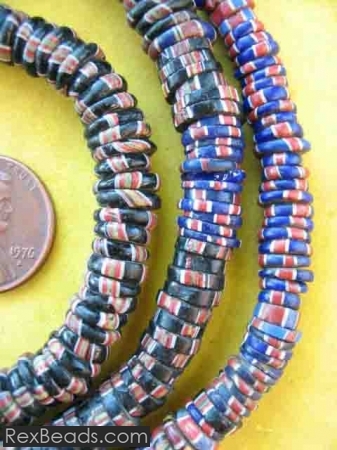 Heishi beads have a fascinating origin which is linked to the ancient history of the Santo Domingo and San Felipe Pueblo Indians who were most proficient in the crafting of these beads. 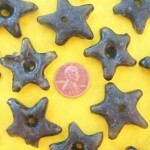 Experts regard Heishi beads as the oldest form of jewelry in New Mexico and North America, as they pre-date to the period before the introduction of metals. 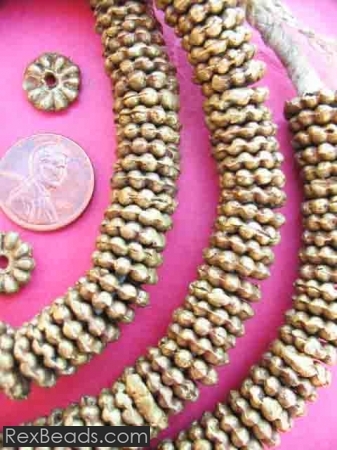 The “heishi” in heishi beads literally means “shell”, with particular reference to the pieces of shell which are drilled and ground into the beads and then strung into necklaces. Today, however, heishi has come to refer to tiny beads made by hand out of any naturally occurring material. 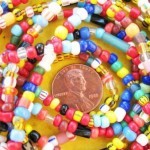 The colors of Ghana beads have meaning. 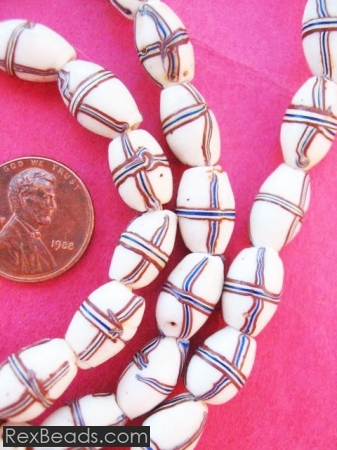 For instance, in certain parts of Ghana, white colored beads evoke fertility; blue colored ones are associated with purity; while golden ones are a symbol of wealth. 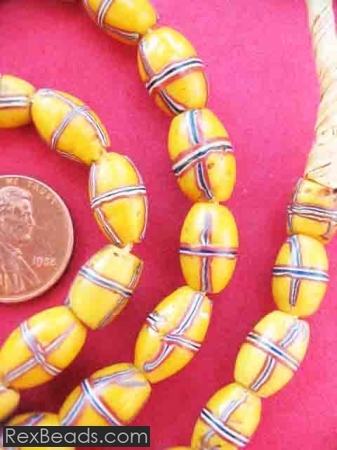 Bodom beads are yellow with a diamond shape design of a darker color such as blue and were traditionally produced to be worn exclusively by African chiefs. 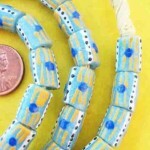 Once you know what the colors of your beads symbolize, wearing them becomes a much more personal experience. 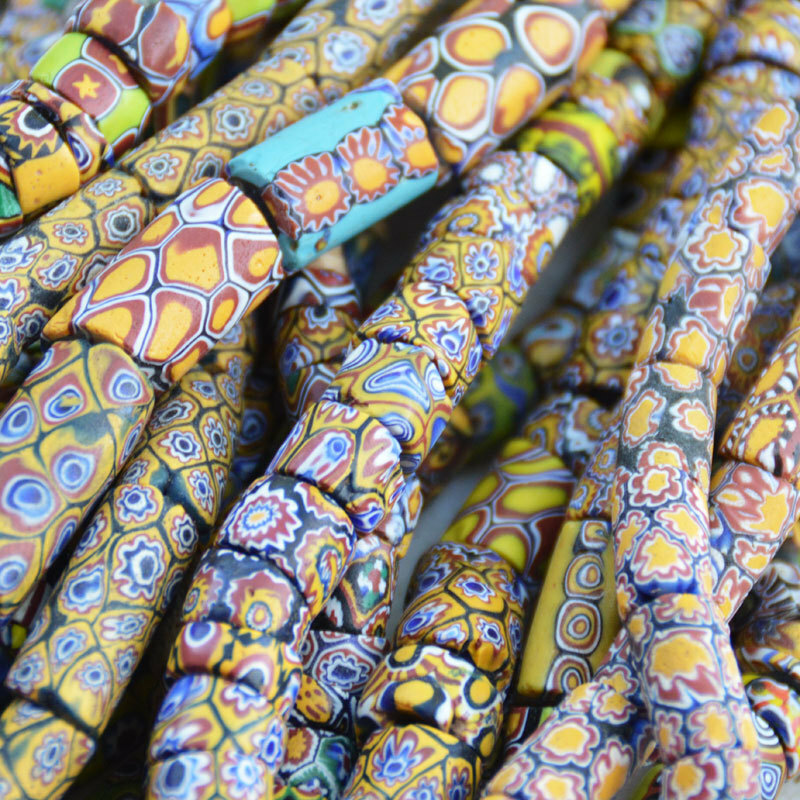 Millefiore beads just happen to be some of the most beautiful African beads available. 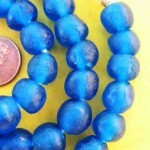 Millefiore beads are crafted through the application of numerous layers of vibrant colored glass which are fused together in cross sections and thereafter plastered onto the bead surface. 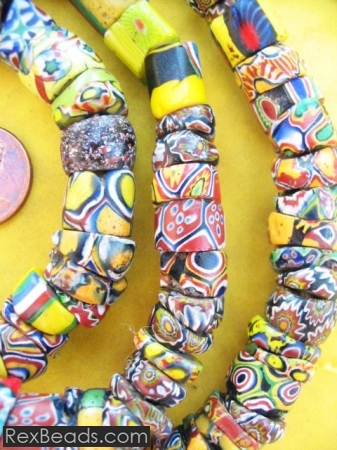 Various designs are used to decorate the surface of these beads including the popular flowers, faces, as well as abstract patterns. 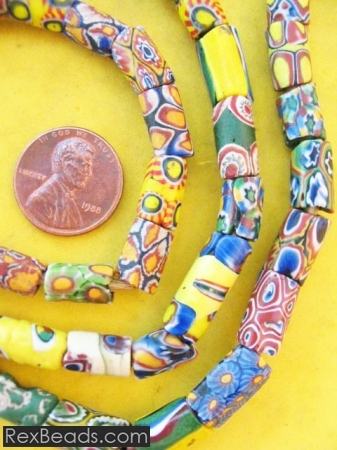 Widely recognized for their aesthetically appealing flower designs, these beads are a favorite of African bead collectors the world over. 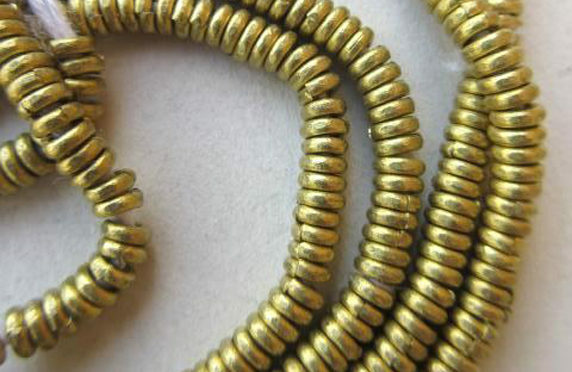 One of the reasons for the popularity of Millefiore beads amongst collectors is the fact that each bead is handmade. 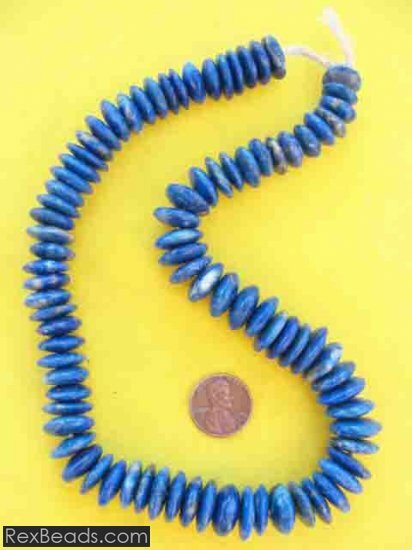 As such, when making their purchase, the collector can rest assured that they are adding a very unique and one-of-a-kind bead to their collection. 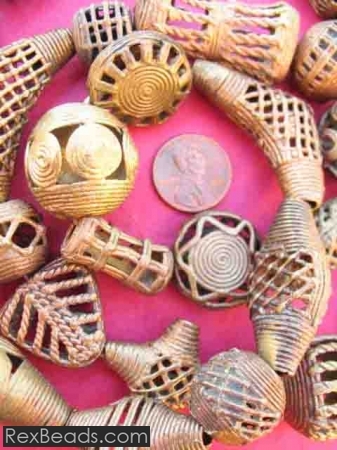 French Cross Beads are African trade beads with a history dating back to the late 19th century in Africa. 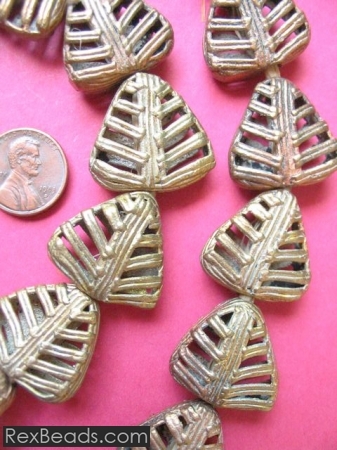 French cross beads were made in Venice and commonly used for trading purposes in Africa during the late 1800s and the early 1900s. 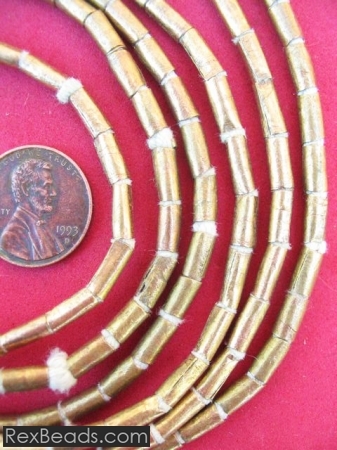 However, in the late 1960’s French cross beads witnessed a revival when bead traders began to export them from Africa into the United States and Europe. 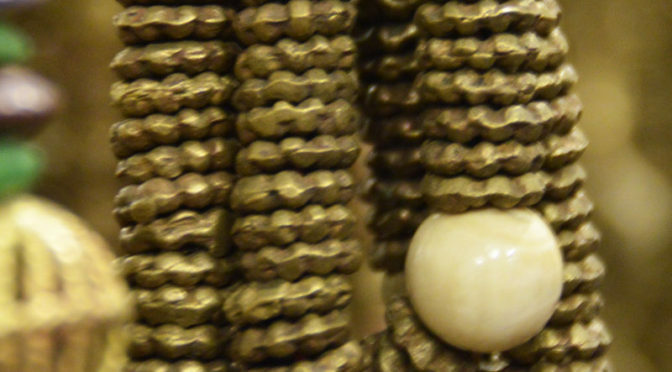 Today, French cross beads can be found in many expensive private collections around the world. 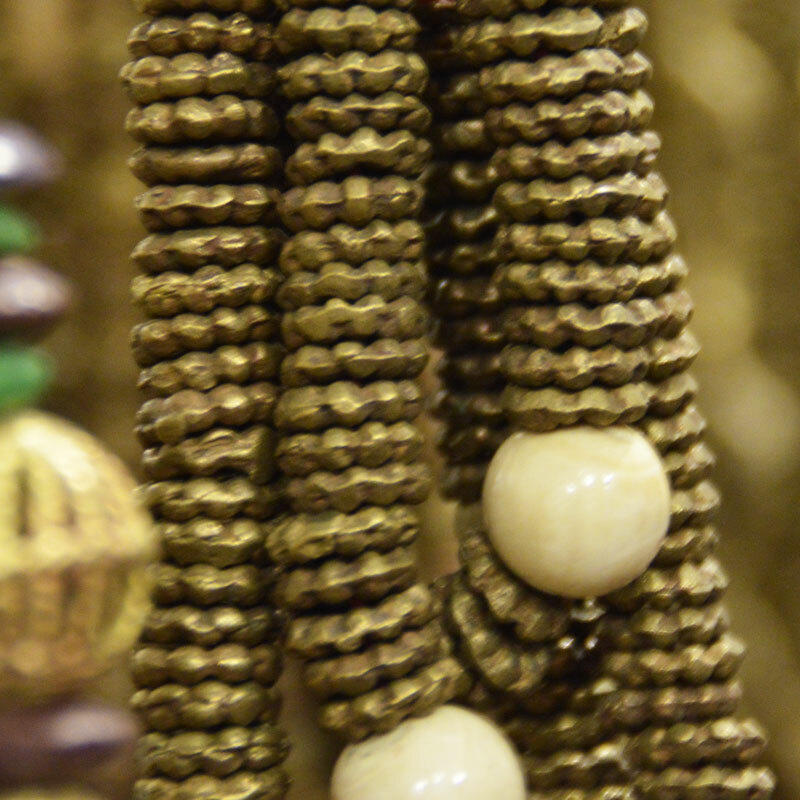 Like other African trade beads, the designs of French cross beads are constantly subjected to ever-changing and dynamic fashion trends, with many of the styles that were available just a couple of years ago being completely out of stock in no time. 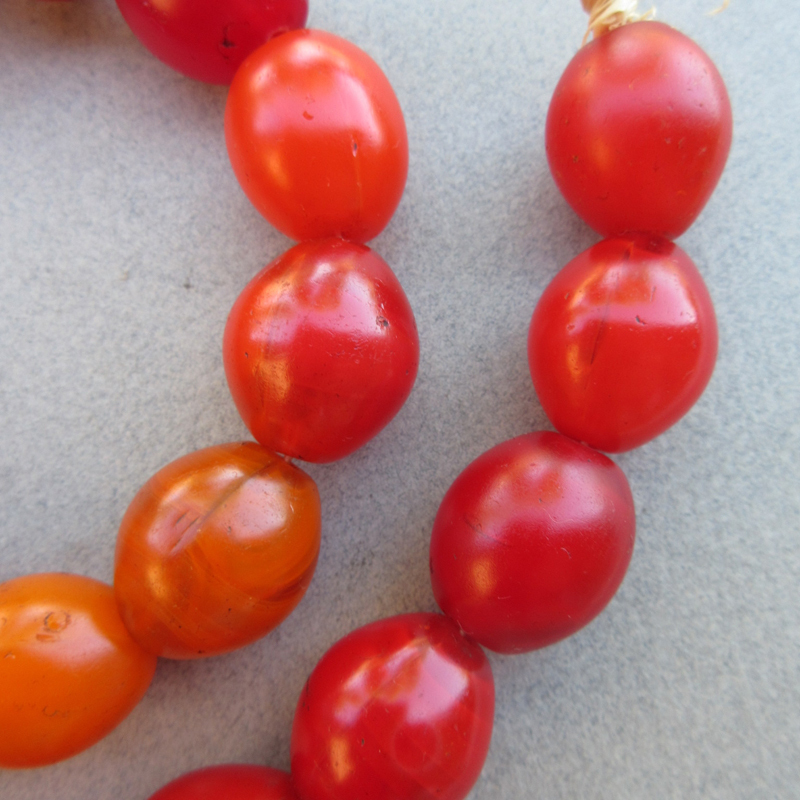 The style of White Heart beads was invented around the year 1480, whereby red glass was colored using actual gold. 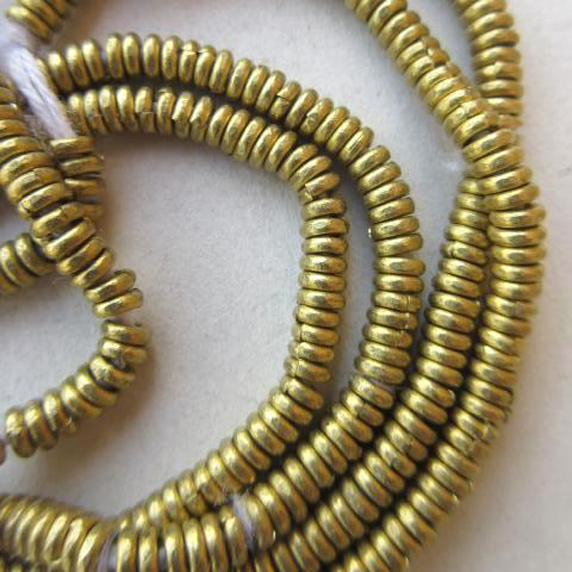 Naturally, because of its value, the gold had to be used sparingly by the bead makers. 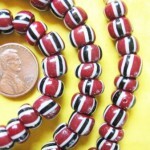 As such, they instead opted to use cheap color filler for the core of the bead with the red only forming the outer layer. 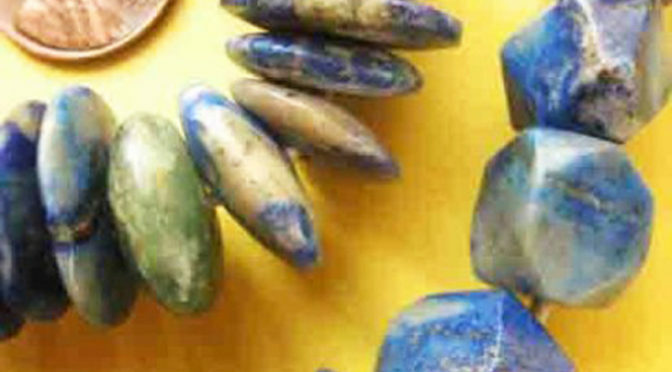 During the years 1480 – 1830, bead makers began using green color to craft these beads. However, after 1830 both yellow and white were commonly used, along with a translucent red coat. 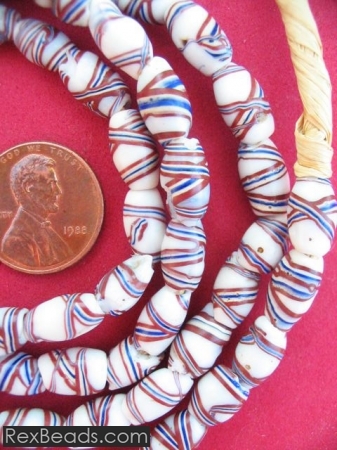 After 1860, bead makers stopped using yellow altogether in making White Heart beads and exclusively opted for white color.